Houses & Homes VA: Why do people just give up? Why do people just give up? We see it all the time, our friends, co-workers and family members constantly giving up on the goals that mean the most to them. Whether it’s losing weight, quitting smoking or finally cleaning out that messy garage people genuinely seem to have a hard time doing the things that they know they should be doing. So what’s the reason for this? Is everyone lazy, non-committed or just too busy to get everything done? I suspect that in the vast majority of cases none of these things are the real cause. 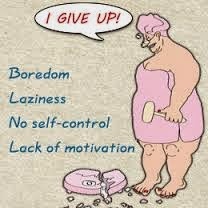 In fact, they are usually just symptoms of the real reasons that we all tend to procrastinate and eventually just quit. If you have this problem you are not alone. Did you know that only 1 out of every 10 people actually succeed at what they start? Are you aware that 80% of the population blames their lack of success on circumstances beyond their control or other people? The problem for most of our failures is not others; it is the simple fact that quitting is easy. It is easier to watch our favorite television show that it is to finish those reports for work. It is easier to take a nap than to get on that treadmill. It’s easier to put things off until tomorrow so that we can do what we want to do instead of what we should be doing. So why do we take the easy road? The honest truth is that quitting is rewarding. Quitting is fun. We certainly enjoy watching a good movie more than doing our taxes and who can compare a lazy Sunday afternoon to doing house chores? Recognizing the fact that doing what you like to do is always going to be a temptation is the first step to understanding why it is sometimes so difficult to be motivated to do what you need to do. One of the main reasons that giving up is so easy is that there are usually no immediate consequences for making the wrong decision. Quitting your diet doesn’t mean that you will be 20 pounds heavier tomorrow, right? You can always begin your diet after the holidays, no big deal. The problem is that this type of thinking leads to never committing, never beginning what you really want to achieve. Another reason that we fail to finish what we start is that many people simply don’t like change. We are comfortable in our habits and uncomfortable with changing our usual routine or adding more requirements to our lives. We may feel that more responsibilities are just too much and will interfere with our much loved “free time”. We fail to see that changing our behavior is the key to improving our lives and being a much happier and more successful person. Finally, many of us give up on our dreams because we simply don’t know how to achieve them. We don’t know where or how to start and decide that it’s never going to happen. This is perhaps the saddest circumstance of all. I believe in the old saying that “where there’s a will there’s a way”. Now that we understand why an astounding 90% of us fail to finish what we start, what can we do about it? Tomorrow I will discuss some very simple techniques as to how to stop being a “quitter” and the right way to achieve success in all areas of your life. It’s much easier than you might think.